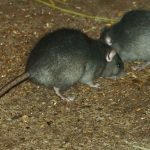 Black rats (known as ship rats, roof rats, and house rats) are small animals with strong bodies, short limbs and long tails. Black rats are the largest group of mammals and omnivores. They are serious pests to farmers as they eat a wide range of agricultural crops. Diet: Their preference for food includes fruits, berries, vegetables, cereal, pet food, nuts, grain, slugs, snails and rotten food. Habitat: As excellent climbers house rats usually live in spaces on the tops of buildings, on roofs or in attics. In addition, house rats live in sheds, garages, boxes, ceilings, under floors, in wood heaps and in thick grass. Impact: Damage to structures by chewing, eating stored foods and carrying diseases, such as Hantavirus. Rats are most famous for spreading the highly contagious bubonic plague in the Middle Ages. Rats will attack both animals and humans. Human babies and even adults have been killed in rat attacks. Rats like to eat, so keep your homes clean and do not leave food out. Make sure that your home and storage areas are clean and dry. Make sure that you clean your sheds, crawlspaces, and garbage cans often. Close up any small holes and cracks they can come in through.